This type of gravestone is not common in my area at all. A zinc marker is pretty rare all by itself. A zinc bedstead is even more so. It can be found at Evergreen Cemetery in Fitzgerald, Ben Hill County, Georgia. 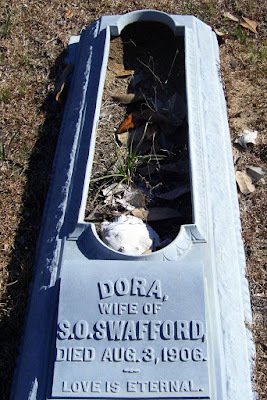 Inscription: Dora, Wife of S. O. Swafford, Died Aug 3, 1906. Love Is Eternal.